A superior first-class hotel, the Internacional Palace Lucsim is located on the best part of Boa Viagem Beach. 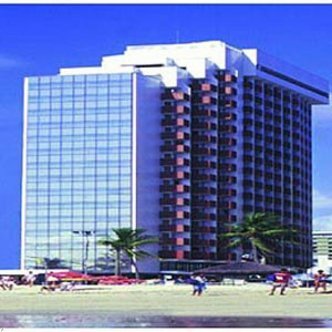 The hotel is also located in the heart of Recife's total excitement and just 10 minutes from the business area. Recife Airport is five minutes from the hotel. All of its rooms come with an oceanview and complete bath. Air conditioning, radio, color TV and minibar also are included in each room. All of the guest rooms are comfortable and nicely equipped to give a feeling of being home while away from home. The hotel also has a variety of facilities and services that are sure to meet the needs of both business and leisure travellers. Carnival Package: From 02 to 06 of February will be Carnival in Brazil and our hotel just work with close package with 04 nights.